KSB: To speak of trends is perhaps anachronistic in the panorama of contemporary art. However, there are relevant searches for identity in the aesthetic discourse, some cases are outstanding such as, Alexander Apóstol with such works as What I am looking for? Even his work Caracas Suite suggests personal explorations of cultural representations. Within the sphere of a discussion where it could be out of place to speak of identities, and even more so at a time when things in Latin American have been exorcised, how can one understand the questioning of identity in contemporary Venezuelan art? RA: Exorcising marginality or regionalism is very serious. Local narratives exist which insert themselves in a globalized context. In the case of Alexander Apóstol, one must admit Residente Pulido was the work which marked the guidelines for him to make a qualitative leap forward. This work was shown at the Sao Paulo Biennial and presented in Spain. A simultaneous work was Fointableu, where Alexander took pictures of books on architecture by Villanueva, Boulton, and Paolo Gasparini, localizing their work in one way or another. Throughout his previous works associated with a more intimate environment, Apóstol looked for a method more closely connected with public space. Residente Pulido shows some buildings with closed windows and doors covered by a kind of membrane, representing the impossibility of establishing an open relationship between the exterior and interior. Previous works, Pasatiempos or even Gallinero Feroz, were related to modernity, and the heroic process of modernity in Venezuela, the relationship with the United States, the proliferation of purchasing catalogues and the dynamics of abundance which established itself domestically. He has flourished using modernity as a theme. After completing Residente Pulido, Alexander went to Brazil and then to Spain, preparing Torres de Europa, a piece establishing a far more global relationship. Las Torres are in fact photographs of CPU's (computer processors) and represent a metaphor of a more technical world. One way or another, this subject has become increasingly seen in Alexanderí­s work, for example, the communication practices of young Latin Americans who aspire to the first world development (What I am looking for?) is something that occurs in a very large sector of society, both on one side of the Atlantic and as on the other. KSB: According to the curator Miguel Miguel, a predomination of constructivist thinking existed in Venezuela in the 60s and 70s, the subsequent and progressive dissolution of which marked new inquiries in the 80s and reached the 90s as a period marked by heterogeneity. Based on this, how is one to understand the creative process of the Venezuelan artist at this time? RA: I believe the new generation of artists have understood the need to search for signs and metaphors that establishes a space that identifies them. It is not a matter of differentiating Venezuelan art from any other, that would be absurd, but of considering that the art developed in a certain country must be connected in some way, or synthesizes some local narrative. This is where the personal strategies of each artist and each curator show the way not to convert this into a closed identity. With respect to the opinion of Miguel Miguel, the only strong tradition in art, almost like the sword of Damocles hanging over artists, is certainly the constructivist tradition and the landscape tradition. We are not like the Mexicans who have very strong traditions. The great viceroyalties perhaps have that other problem, the deeply rooted Prehispanic, Colonial and Republican traditions, but ours is based on the modern outlook. If that is the strongest outlook we have, it seems logical for the Venezuelan artist to provide some continuity. Our country's "modernity" is currently undergoing a very strong process of deterioration. We already visualize the ruins of that heroic space and its great expectations. When I attend a seminar abroad, I establish two visual situations; between the large walls of the ranches and the freeways, or two aspects which co-exist in the same city. I believe that this is what we should be in-tune with. 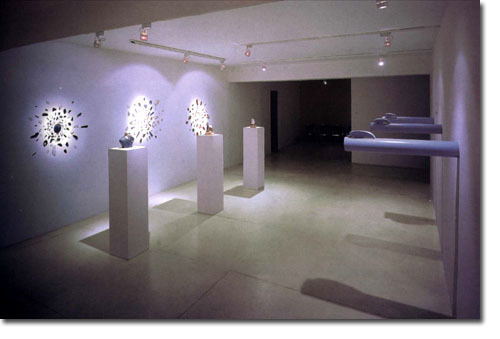 One can appreciate works constructed within very conceptual or neo-conceptual parameters, very minimalist. In fact, considering the works of Eugenio Espinoza, of Sigfredo Chacón, the constructive tradition is already present, what happens is that they have surpassed the original languages and have incorporated other contemporary markers. In a recent photographic exhibition I identified two preoccupations of interest. One, connected with the intimate space where the portrait, or self portrait, the relationship of the subject with its environment, was very present. The other is related to public spaces, architecture, urbanization, where the human figure is absent yet the reading of this space is marked by subjectivity. This appears generic, but that's the way it is. I believe that we are currently in a transition stage where new responses, already beginning to take shape, are being generated in contemporary art.